The start of Olmert's prison term will close a chapter in his long legal odyssey since leaving office in 2009. He was initially given six years' prison in May 2014 for taking bribes in the early 2000s in connection with the construction of Jerusalem's massive Holyland residential complex, but the sentence was later reduced to 18 months. Last week, an Israeli court handed him an additional month for obstructing justice. He admitted to the crime as part of a plea bargain in that case. His prison sentence could still be extended further. The Supreme Court is still debating his appeal against a third sentence of eight months for fraud and corruption. Born near the port city of Haifa, Olmert was elected to parliament in 1973 as a member of the Likud party and was mayor of Jerusalem from 1993 to 2003. He later served as a cabinet minister, holding the trade and industry portfolio as well as several others. He broke off from Likud with then-prime minister Ariel Sharon to form the Kadima party in 2005 and became premier in 2006 after Sharon slipped into a coma. He is in part known internationally for relaunching peace efforts with the Palestinian Authority, including offering massive concessions - which were rejected by Mahmoud Abbas - at the Annapolis conference in the United States in 2007, but the corruption charges against him have come to define his legacy. After the Supreme Court upheld one bribery conviction in December related to campaign financing but acquitted him of another linked to the residential complex, a tired-looking Olmert maintained he had not taken any bribes. "A heavy weight was lifted from my chest today, when the Supreme Court exonerated me of the main charge, of Holyland," he told reporters outside the courtroom. "I was never offered bribes, nor did I ever take any." Olmert's stay in prison will be somewhat more luxurious than the average inmate. The prisons service says that block 10 has six cells, each with three beds, ensuite shower and toilet, a closet and a table, chairs and television. There are public telephones in the corridor, classrooms and a block recreation room, a visiting room, two rooms for consultations with lawyers, a room used as a synagogue, a library, sports equipment, dining room, and yard. 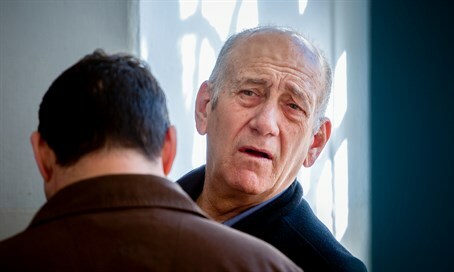 On admission Monday, Olmert, like any other prisoner, will be photographed, searched, given a medical examination and interviewed by various officials, including a social worker. Inmates are allowed to bring from home four pairs of underpants, four pairs of socks, two towels and two sweatshirts without hoods or lining. They can also bring with them one blanket (not a duvet), two sheets, a pillowcase, and religious books and articles. The prison, named for the biblical gatekeeper of the Jewish temple, is no stranger to VIPs. Current interior minister Aryeh Deri spent 22 months there after being convicted in 2000 for taking bribes during a previous term in the same post from 1988 to 1993. He returned to the interior ministry in January this year after his predecessor Silvan Shalom resigned over allegations of sexual harassment. His one-time rival in the haredi Shas party, former health minister Shlomo Benizri, served six months in Maasiyahu after being convicted of bribery, fraud and obstruction of justice.